The Trekker is a new model from Fisher Space Pens. As in every Fisher model the trekker uses a pressurized ink cartridge that will write in many circunstances that are impossible for other pens like being upside down, under water, over a greasy surface, etc. The pen itself is a small keychain pen. The body is made of aluminium with a rubbery tip to improve the grip we liked the texture and pattern of the rubber it helps grip the small pen well enough to write and is confortable in case you need to use the pen for a long time. The cap has a splitring, so you can have the Trekker in your keychain and remove the writing part while leaving the cap in the keychain, you use the pen and then insert it back in the cap. The attachment of the body to the cap seems to be strong but it will not resist and accidental strong pull so there is a little risk of losing the pen. It comes with a quick-break lanyard and a simple carabiner as accesories. 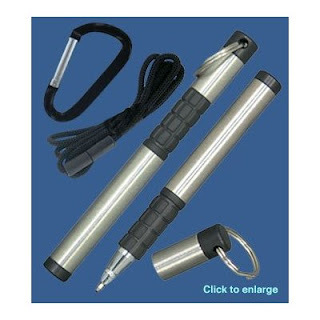 The Trekker is a good keychain pen, a good choice if you like Fisher Space Pens and need something for your keychain. The Trekker can be ordered from Amazon for $25 you can read more in Fisher's website.